Mash-up of various creepy crawlies. 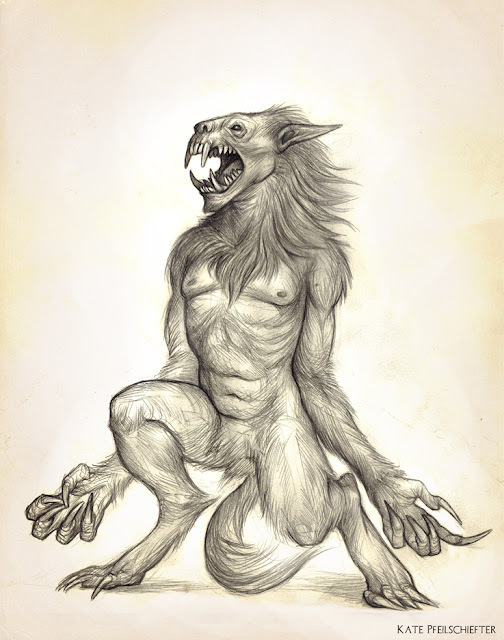 I love wolves, and I love monstrous demon wolves. 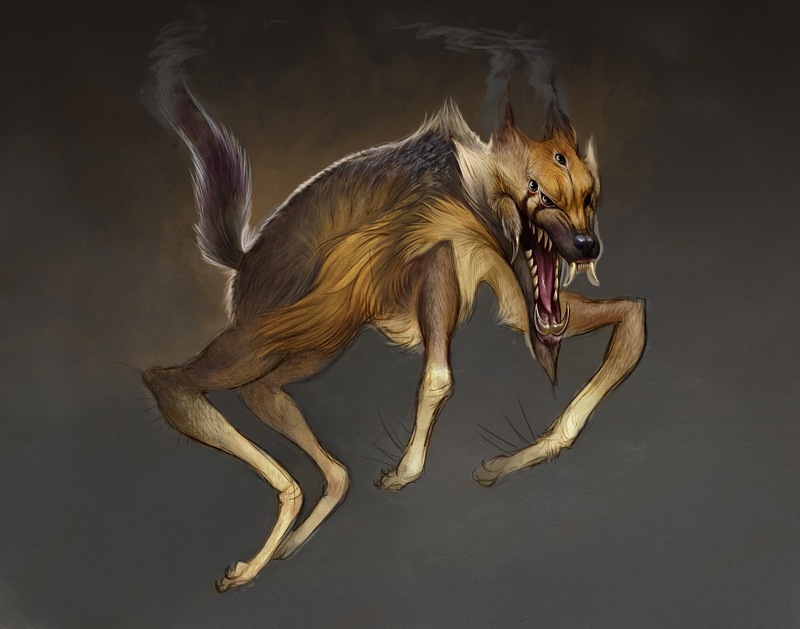 So Wargs are just fantastic. 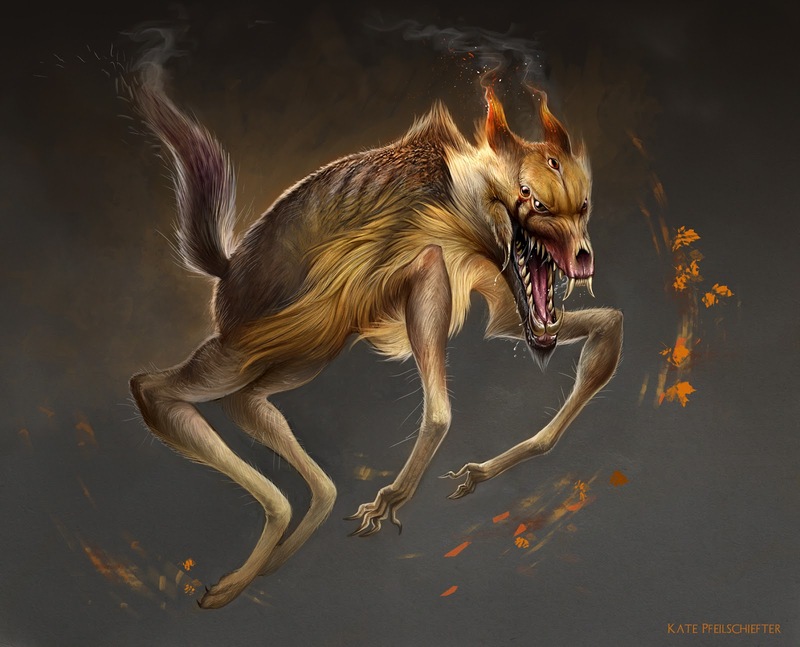 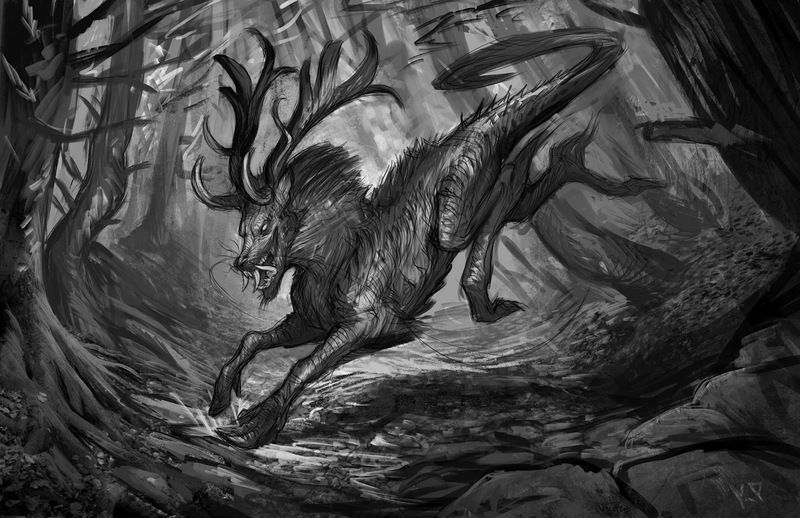 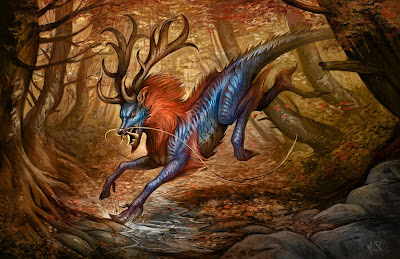 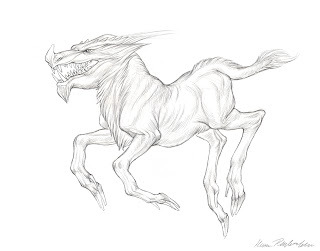 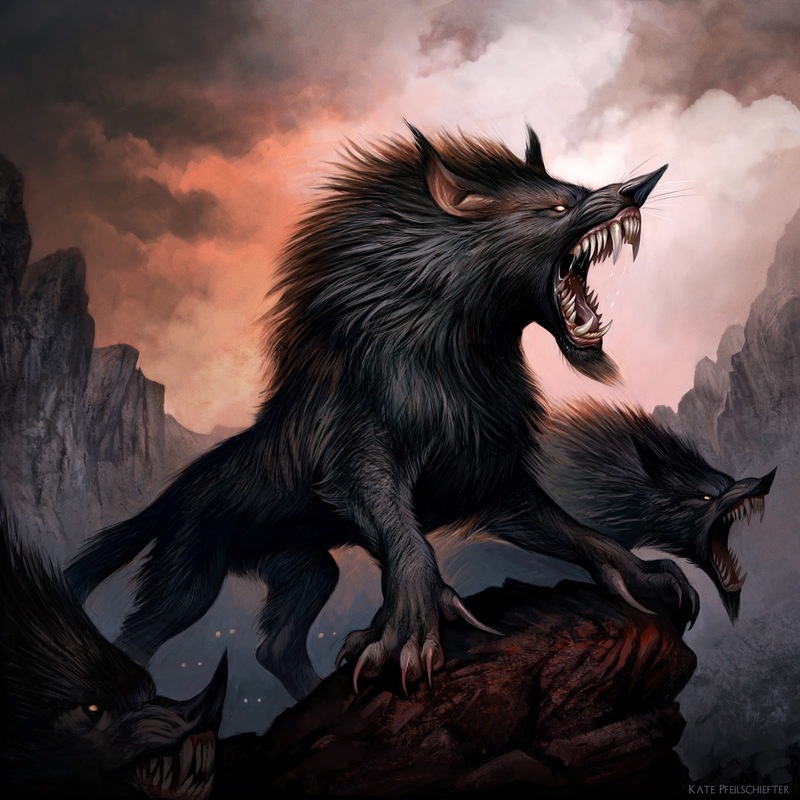 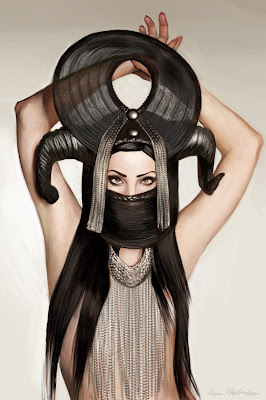 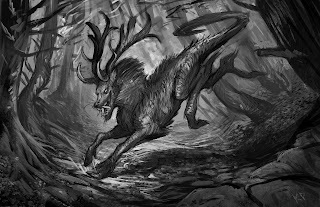 These creatures originate from the Norse mythological legends of Fenrisulfr, Hati and Skoll. 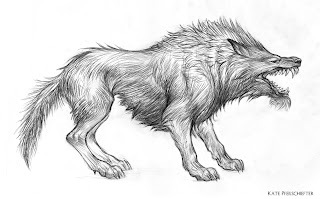 The Norse and old English word for wolf is warg or vargr. 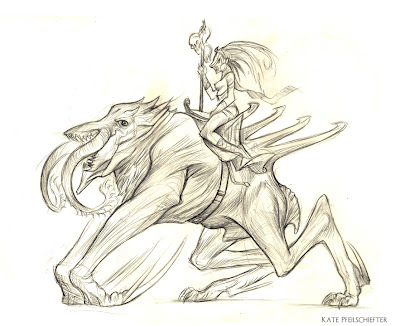 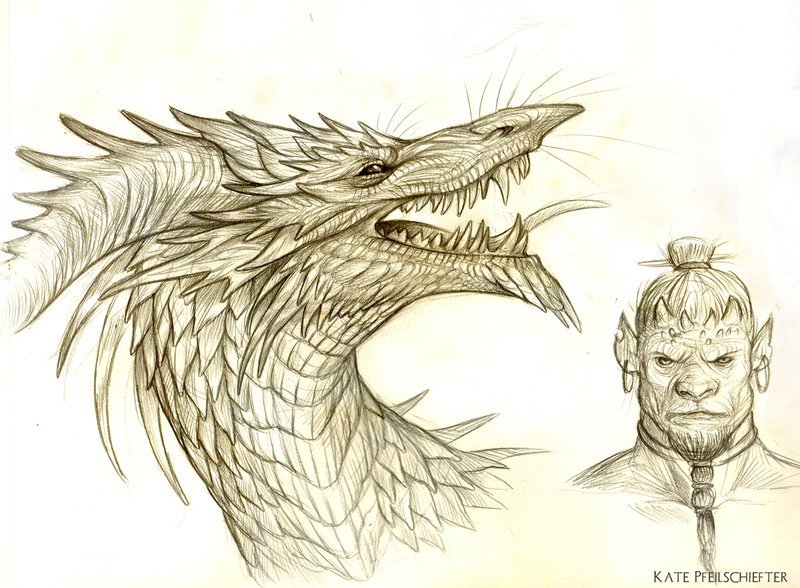 They appear as well in Tolkein's Middle-Earth, and so though I have a great love for Smaug, I chose to redesign the Wargs for The Hobbit's Middle-Earth design contest. 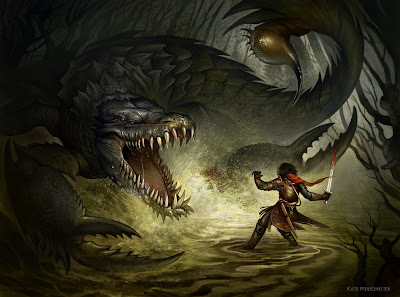 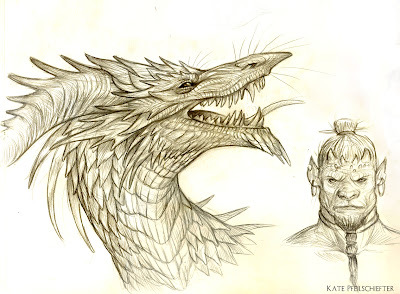 (John Howe already painted the perfect Smaug anyway). 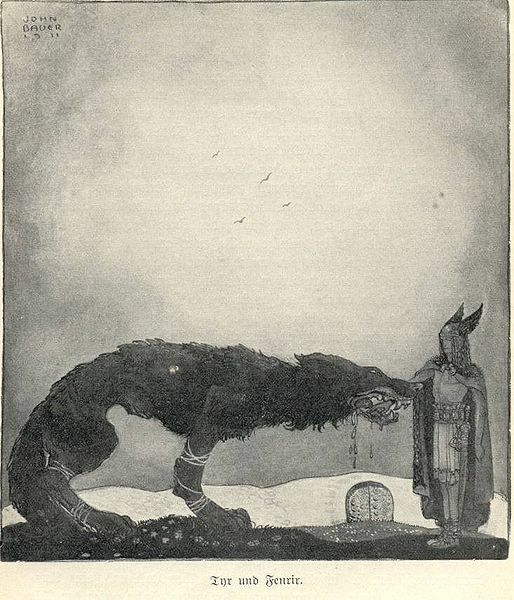 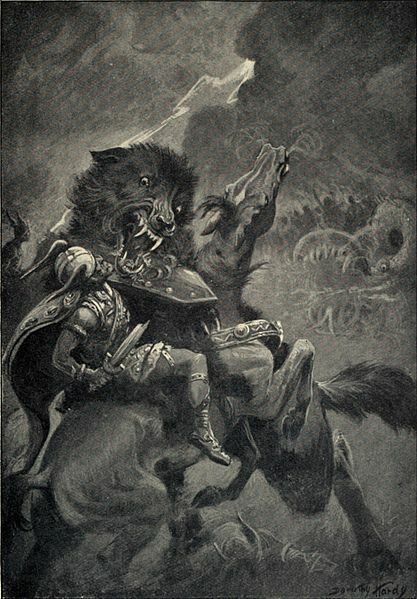 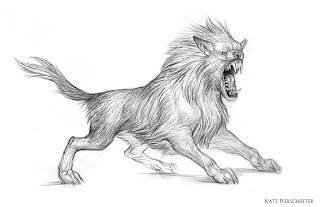 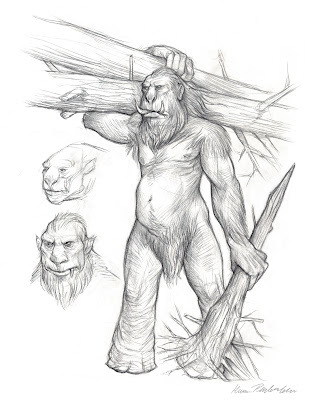 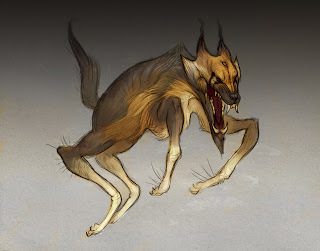 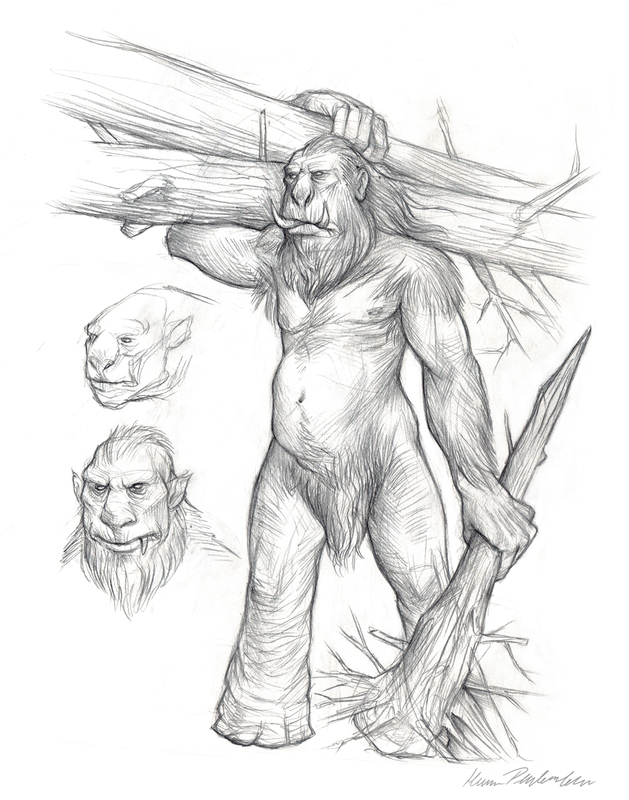 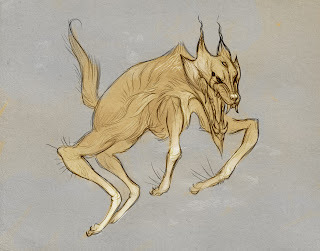 I prefer my Wargs hairier than the hyena-inspired creatures from the Lord of the Rings movies, and was inspired specifically by the old illustrations of Dorothy Hardy and John Bauer. Some critters and Warg concepts. 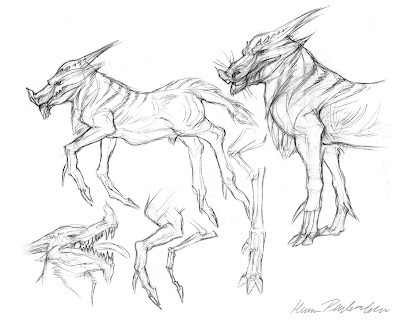 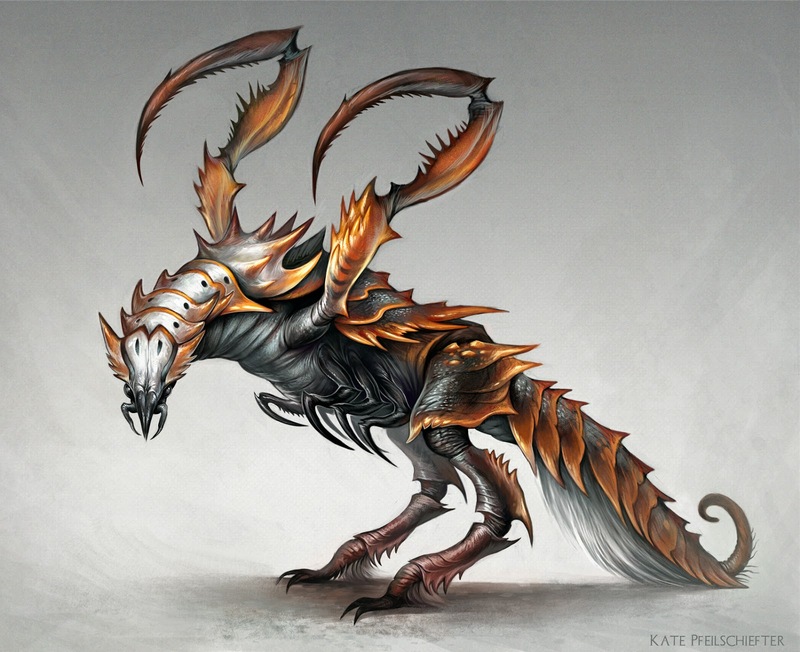 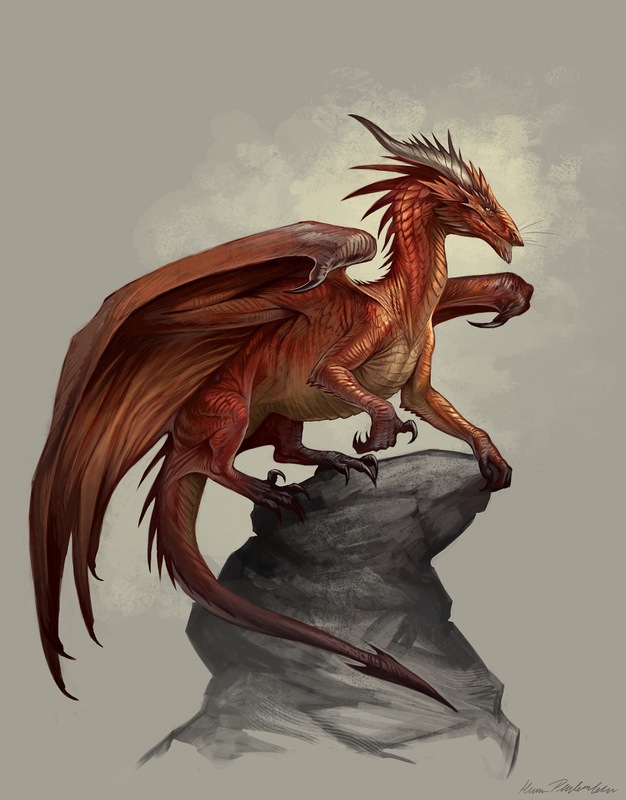 First one is a creature for the Aerie, an omnivorous descendant of wyrms . 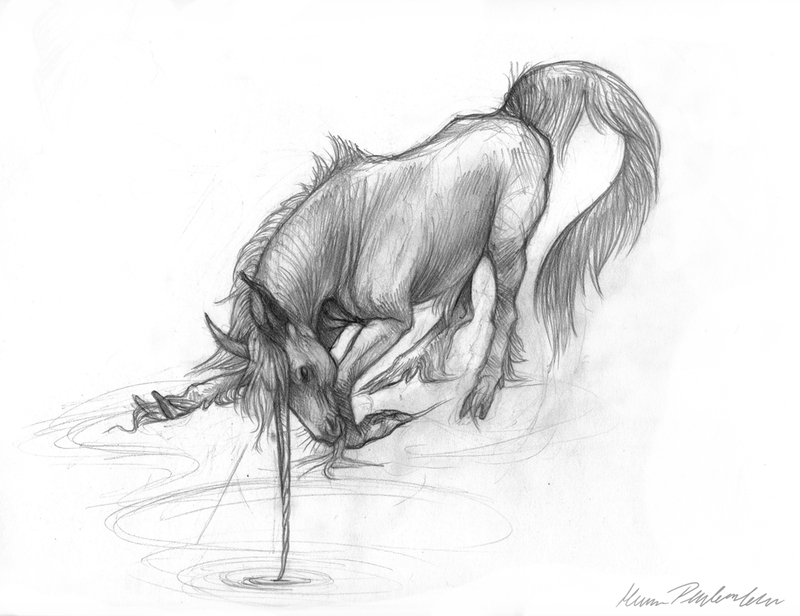 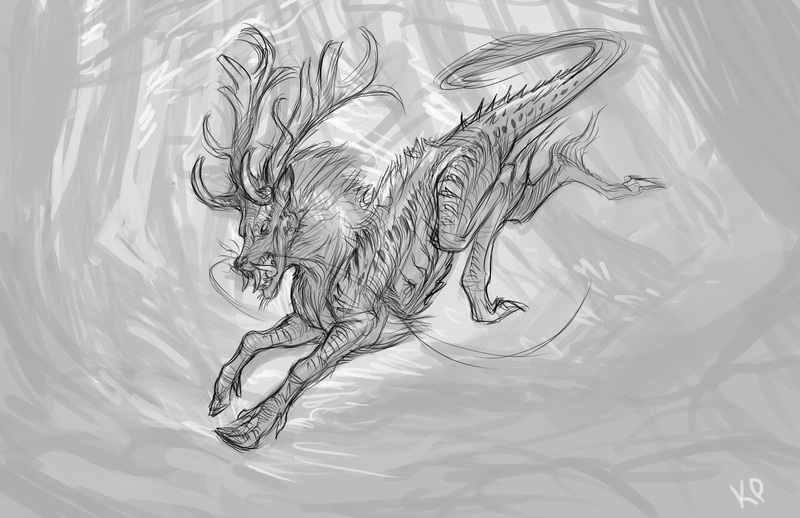 A Qilin/Kirin. 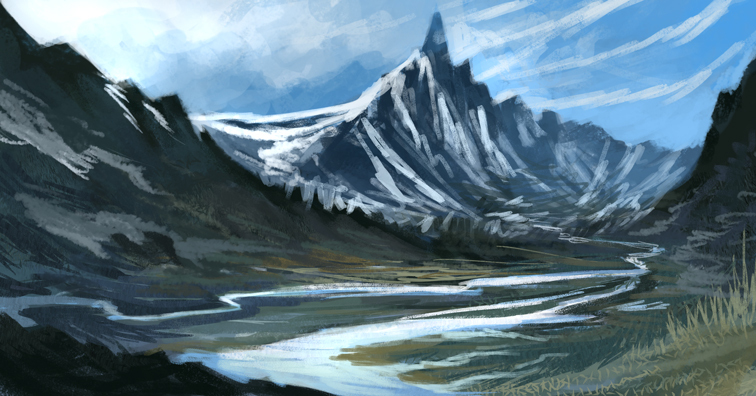 Revamp of an old drawing, now with an environment background. 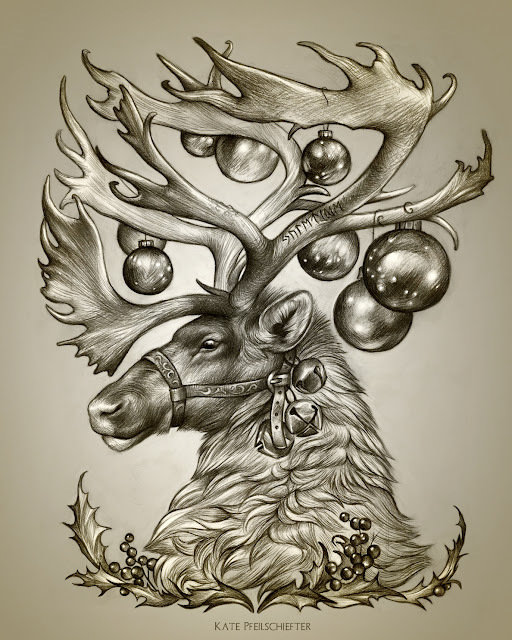 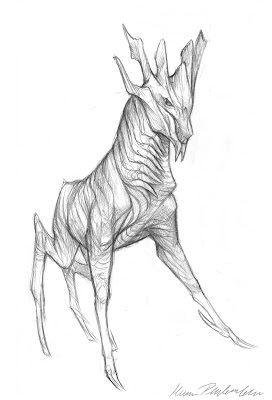 I don't know where the idea of Kirin as fancy unicorn horned deer came from. 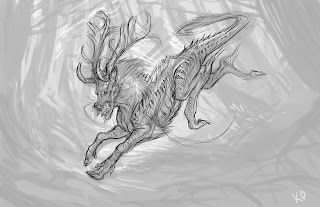 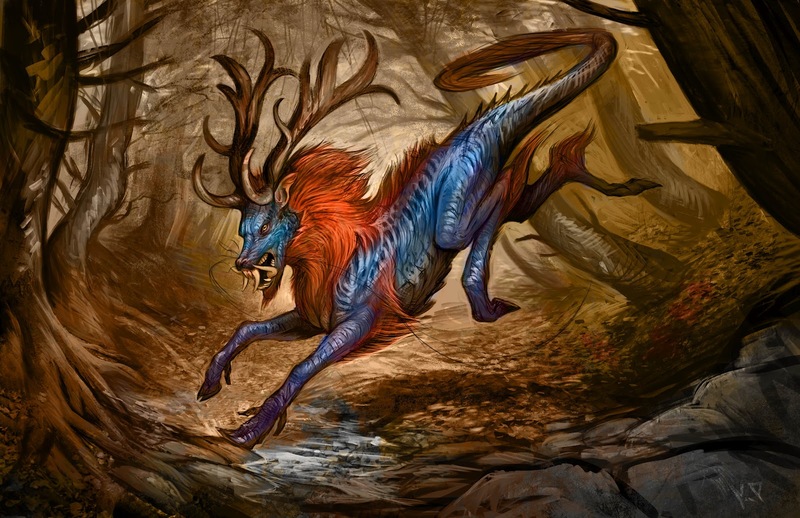 In Chinese/Japanese myth and in ancient illustrations and statues they have antlers, and look more like cloven hooved dragons than anything. 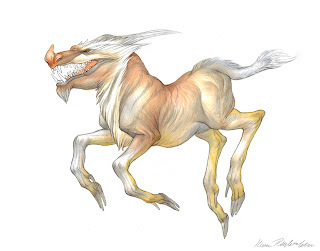 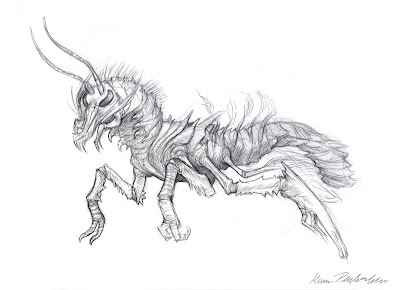 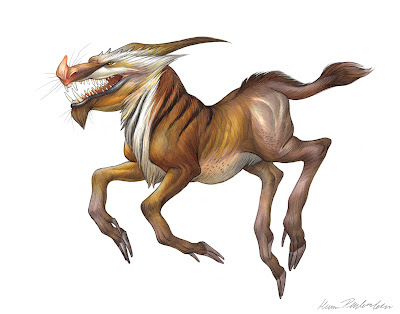 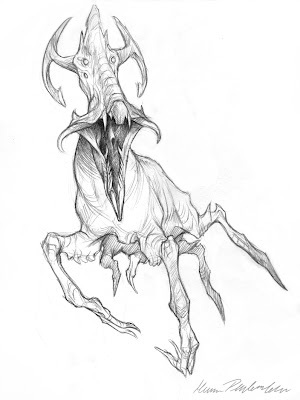 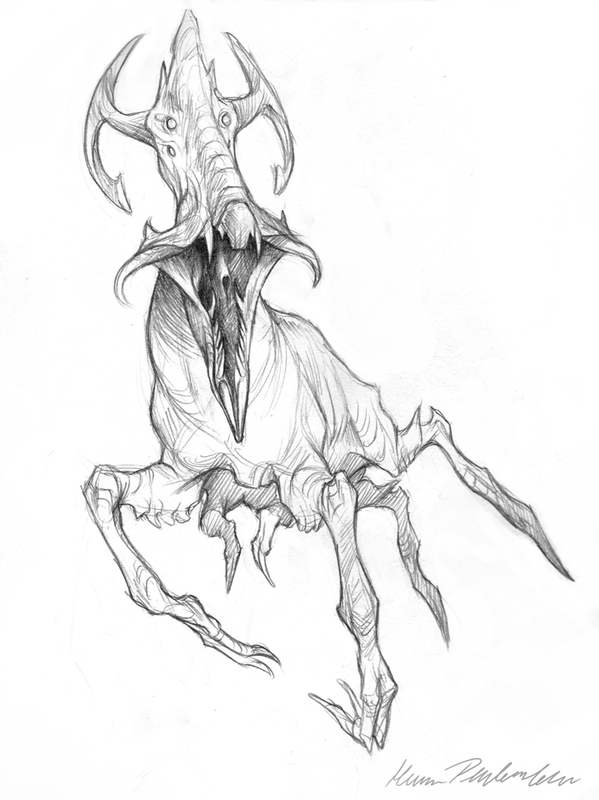 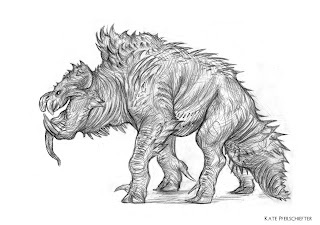 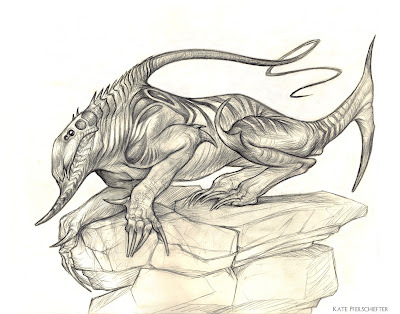 The more unicorn-like variations on the creature remind me more of another Chinese creature called the Sin-You. Anyway. Here's the process I used for this one. Thumbnail drawing, for establishing composition, lighting and rough values. 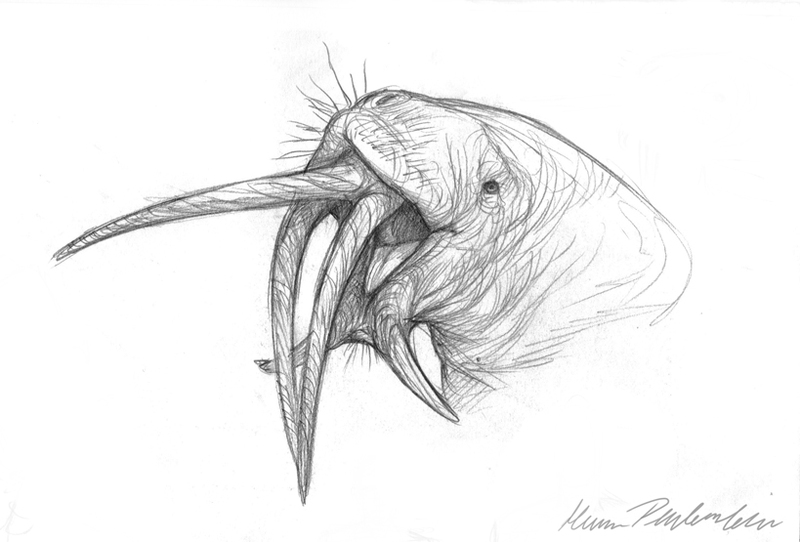 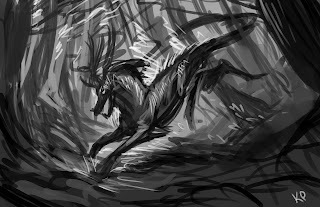 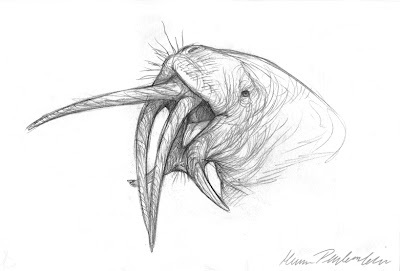 Lowered the opacity and sketched the critter in more detail overtop. 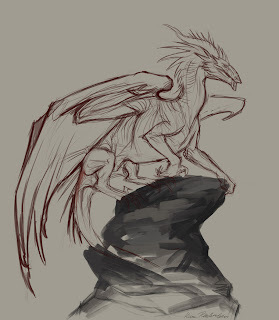 First, painting underneath the sketch lines, I started painting things in more detail/figuring out what was going on. Tossing textures around. 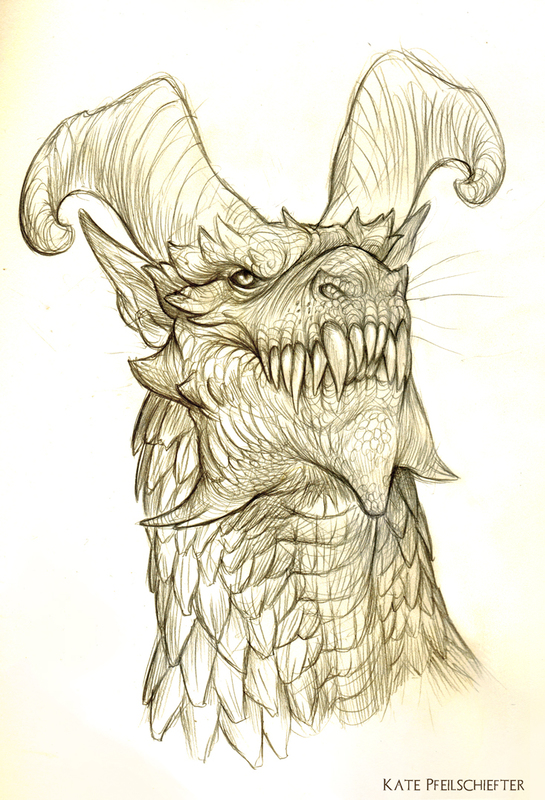 Then I painted overtop the critter sketch a tad. Next, make a color overlay layer, for ya know colour. 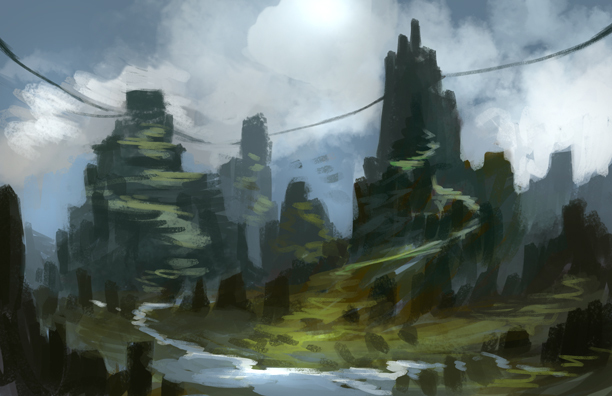 Then started painting over top that once satisfied. 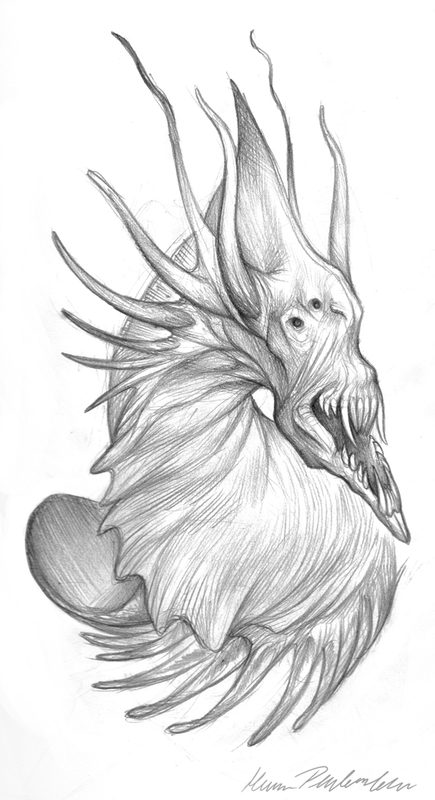 Then detail detail, and finished. 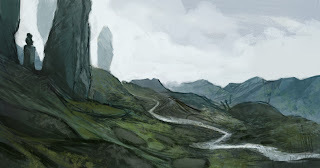 This image went through a lot of changes. 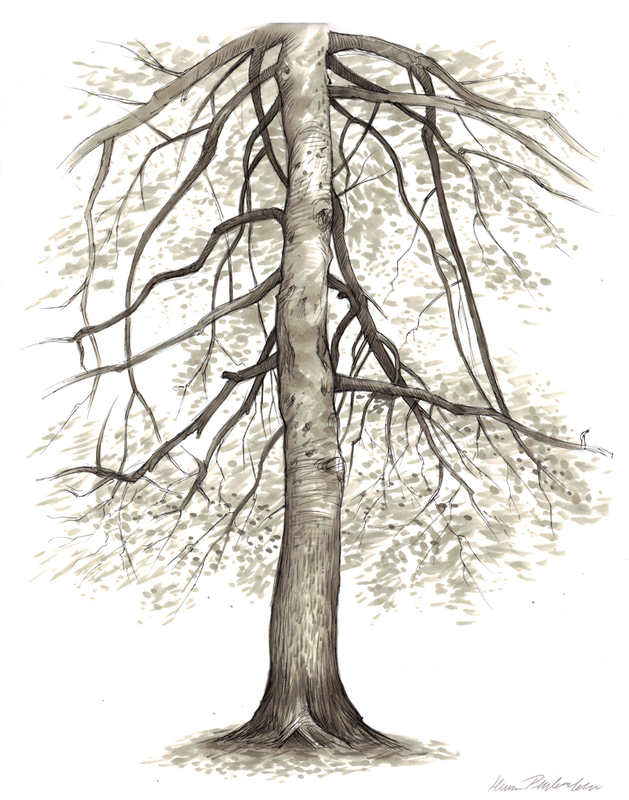 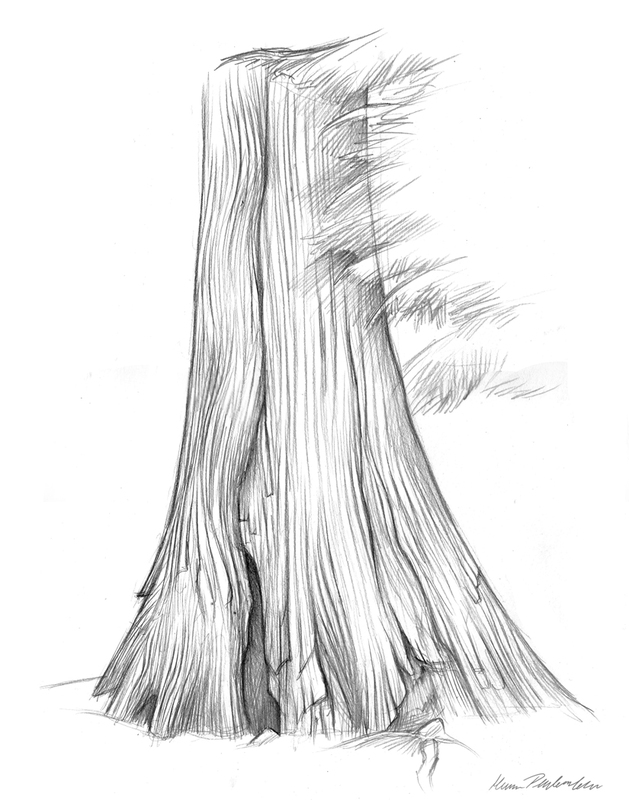 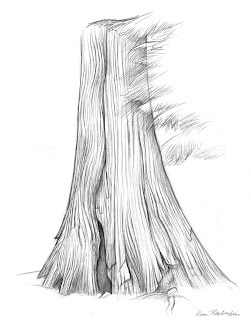 Was initially inspired by some much more subdued looking nature illustrations and somehow, turned into this. Had lots of fun towards the end though with the teeth and slobber. 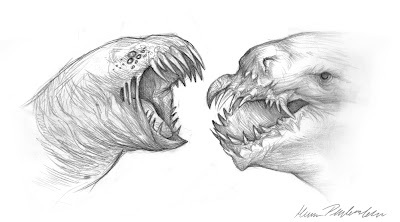 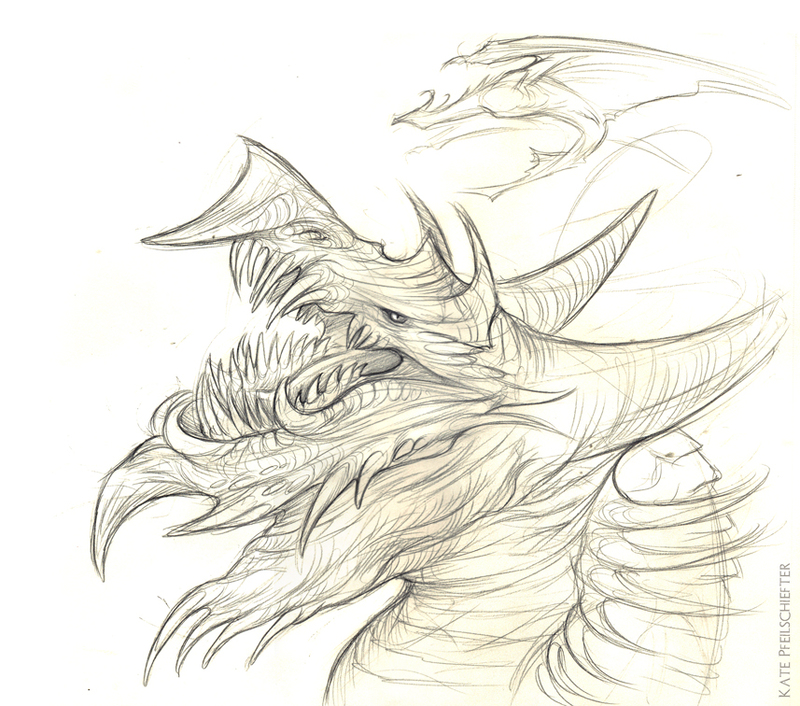 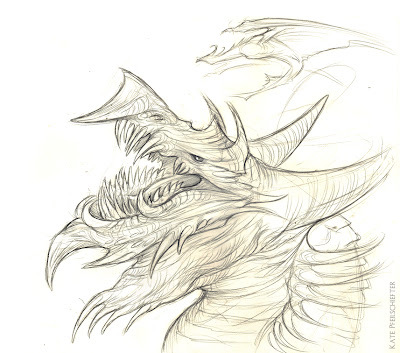 Going to start drawing a dragon head (or creature) a day to relax from schoolwork and stay sharp. Here are some from mostly this week. Fun and practice with Copic markers. Here's the painting and process of a creature I originally doodle/sketched a few weeks ago. 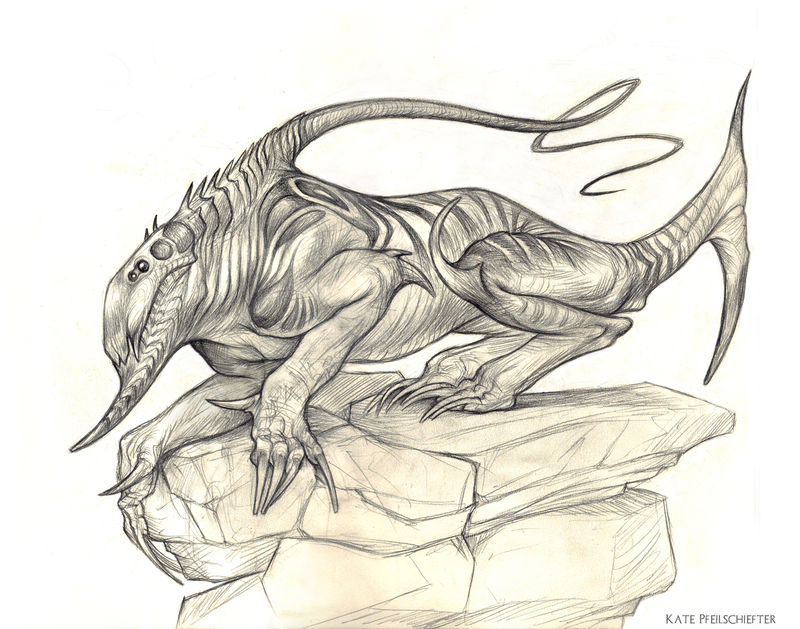 This includes the original pencil/Micron pen sketch, the first few marker washes and the final. 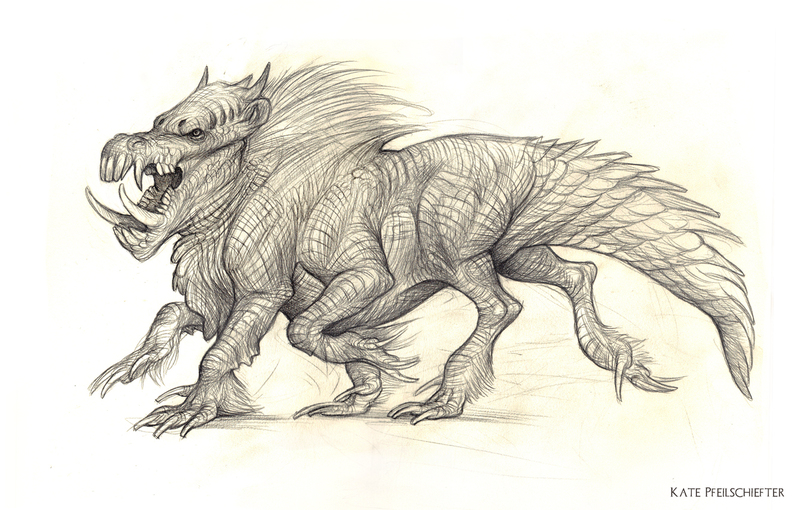 He's some kind of bat-nosed, hairy, crocodile-pig, with long hand hooves. 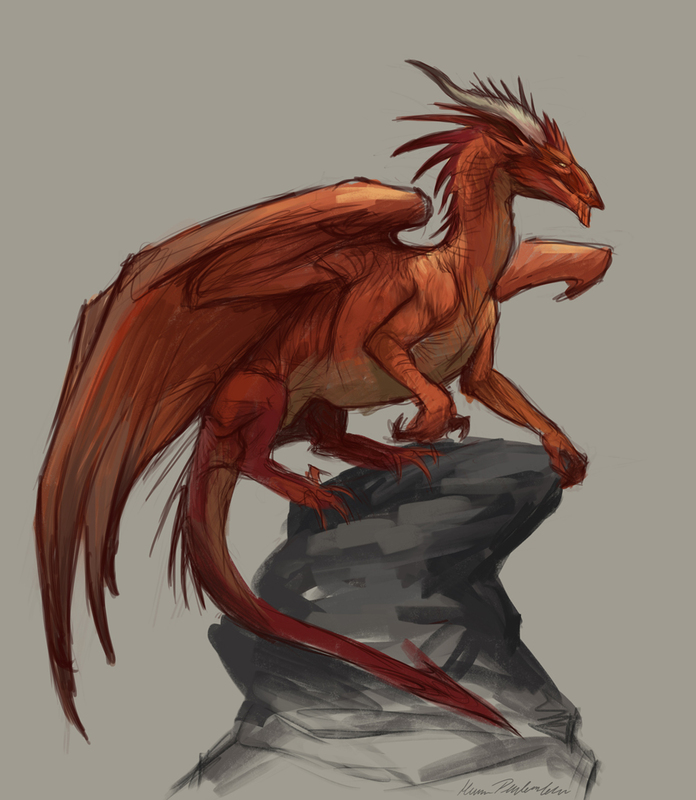 Wanted to paint more dragons, and Arro (The protagonist of my Aerie story/world concept) needed an updated look. 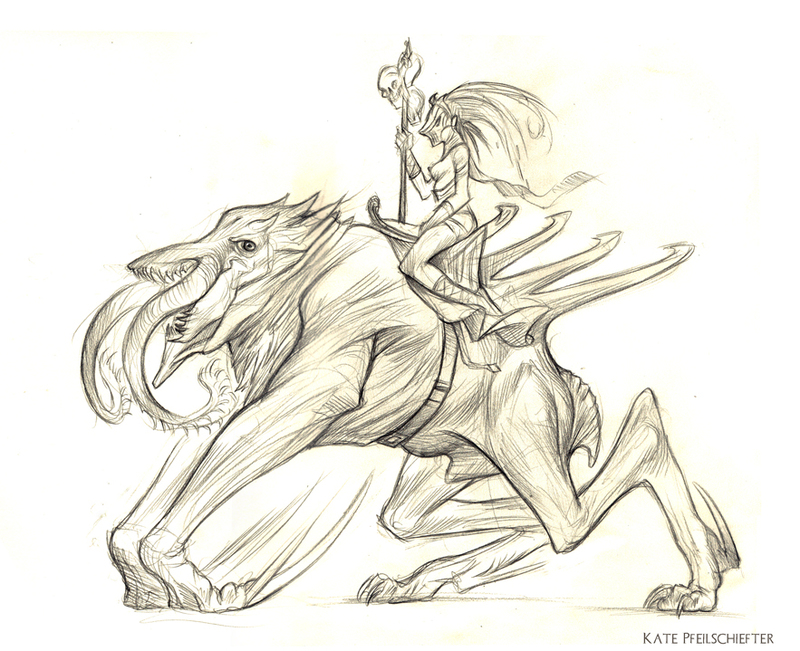 Here are some wips of the painting process. Went with straight colour for this one, so not too many steps other than detail detail detail. 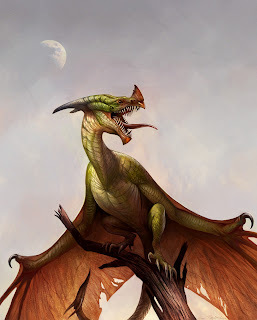 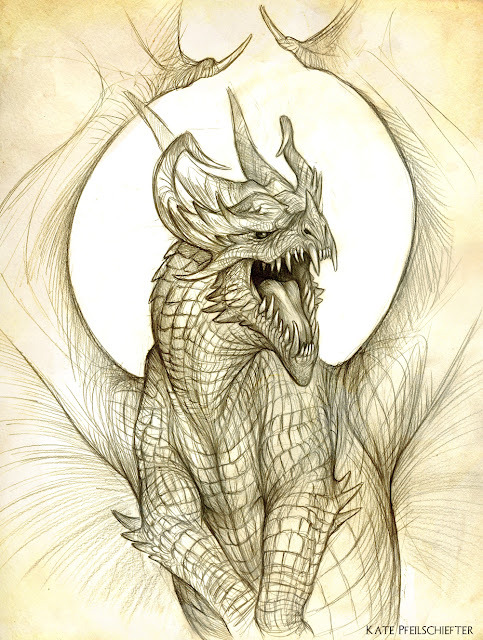 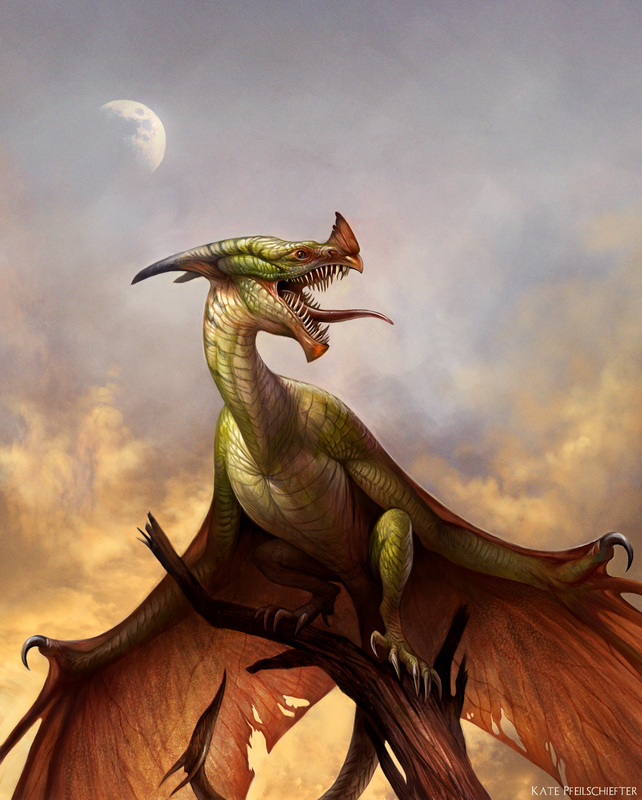 Was inspired by some of my fave dragon artists, Todd Lockwood and L.D. 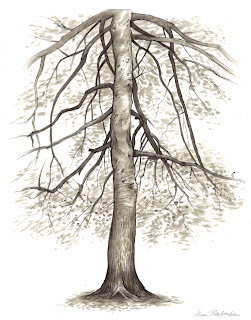 Austin. 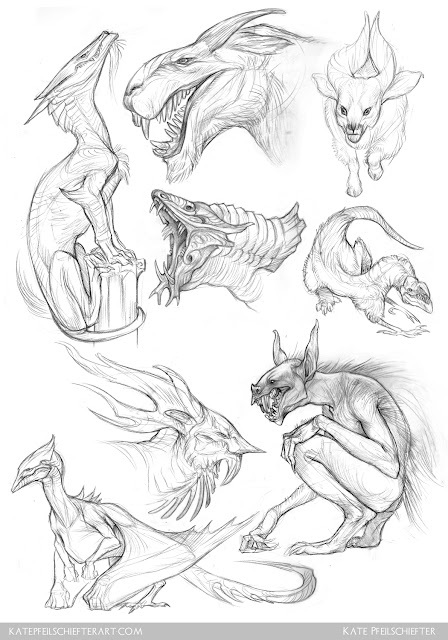 Final image is on the very bottom. 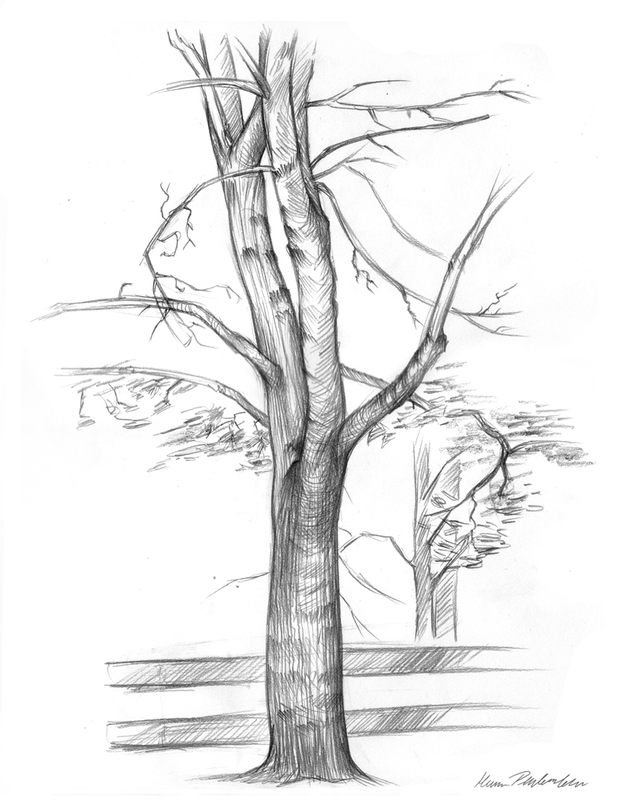 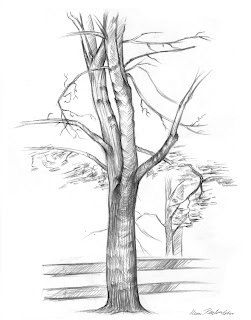 Mastercopy/Study of E.B. 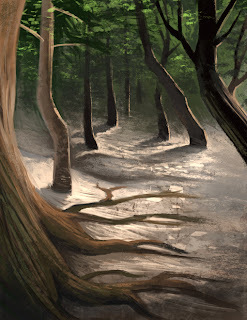 Leighton's "Forest Tryst". 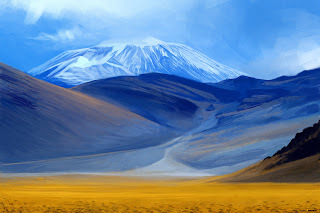 Saw this image featured on James Gurney's blog and immediately wanted to paint it. 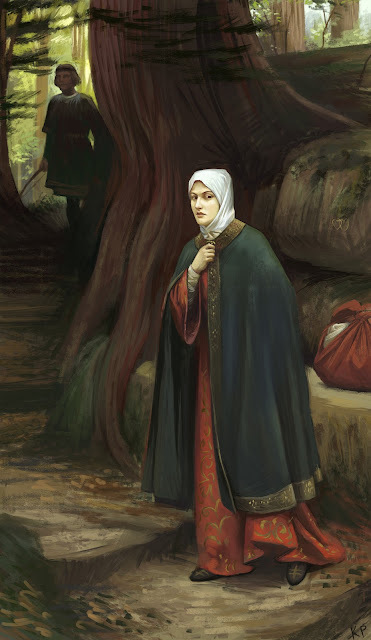 I love forest scenes and medieval clothing. Didn't worry too much about the specific details except for the figures; primarily did this for colour and lighting practice. 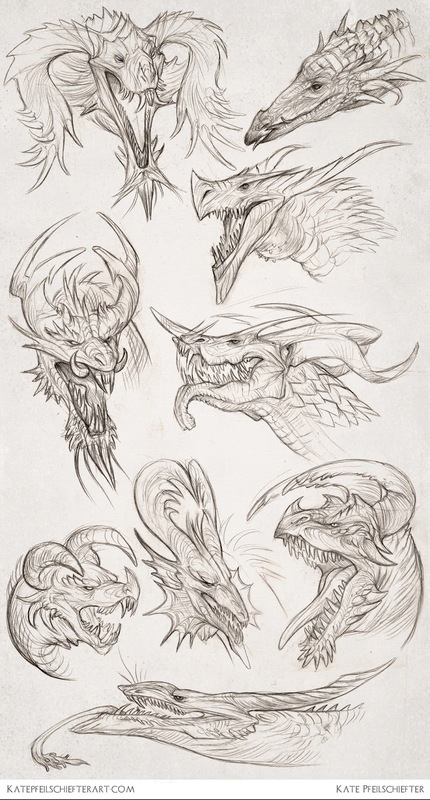 Looks like I found a new artist to admire. 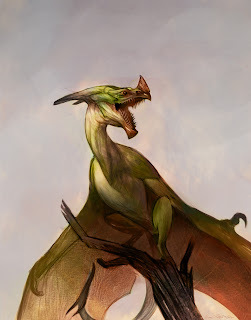 Haven't actually painted a dragon in a while. So here's a wyvern for practice. Started in grayscale, threw some colour on top via color and overlay layers, then detail detail detail.